You Can Obtain a WA Driving Permit Without Passing the Written DOL Exam with a Permit Waiver up to 10 Days Before Class Starts. Step 2. Complete the Pre-Application with the DOL. It will generate a Driver License Number for you. 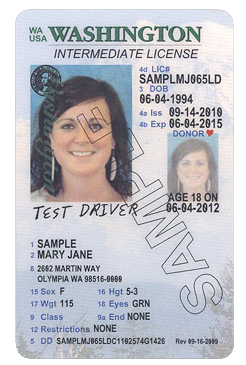 Step 3- Call 360.892.6988, tell us what the generated Driver License Number from the DOL Pre-application. Step 5- You go to the DOL to get a permit. If you have any questions about want to bring to the DOL call the DOL 360.260.6122. -If you have any questions for the DOL please feel free to contact them 360.260.6122. Note- If you are under 18, you must hold your permit for a minimum of 6 months before you can apply for your WA State Driving License. Target Zero — a goal to reduce traffic fatalities and serious injuries on Washington's roadways to zero by the year 2030. The goal is zero deaths and serious injuries, because every life counts. Washington's new E-DUI law takes effect 7/23/2017. Click on the link for more info.